University of Georgia poultry and food scientist Daniel Fletcher can make "a silk purse" if he wants to. In his research, he's turning dark meat, the underused "sow's ear" of chicken, into something more valuable: white meat. "Americans prefer the breast meat," said Fletcher, who was recently named a Fellow of the Poultry Science Association, the highest honor the PSA bestows. "Dark meat evolved into being a by-product of the chicken industry." This is due in large part to dark meat's fat content and its distinct taste, making it far less plastic, or able to be molded into shapes, than white meat. Dark meat gets its color from myoglobin, which plays a key role in transporting oxygen and shows up in the muscles an animal uses most often. Chickens walk, but rarely fly. That's why leg meat is dark and wing and breast meat is white. Through centrifuge and other extraction methods, Fletcher is "creating" white meat. Dark meat's disadvantages are its fat content and color. And that's what he removes. "We grind the meat up, add excess water and make essentially meat slurry," he said. "We then centrifuge it at a high speed, which breaks up the meat. What settles out are the raw, extracted layers." The result is three distinct layers: fat, water and extracted meat. "The dark-meat project is partly a training project for students," Fletcher said. "We use it to teach students how to take apart and create new foods." 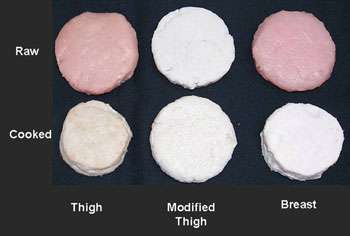 When the modified dark meat – in this case, thigh – is cooked, it looks incredibly similar to breast meat. Out of the skillet, unmodified thigh meat is much darker. "Who's going to buy bleached-out dark meat?" Fletcher asked. "It won't be anything the consumer ever saw, as far as the grocery store." The chicken, whitened by removing much of the fat that colors it, is intended for restaurants and fast food businesses. Fletcher compares using the modified dark meat to a restaurant-style grilled chicken sandwich popular today. The chicken "breast" starts out as a "frozen shingle" of processed chicken with grill marks burned into it. "This is good chicken, but you'll never see it in Kroger," he said. "It's a high-tech product. But in the hands of a 19-year-old professional, it's incredible." The prepackaged grilled chicken, which also tops salads, is made specifically for restaurants. If the average consumer took it home and let it thaw before cooking, he'd be left with a puddle of water and meat. But it sure does taste good at a restaurant. "This type of product fits into that scheme of food," Fletcher said. "Food is an extremely dynamic portion of life," he said. "A lot of foods we now consider good foods were yesterday's by-products." Yesterday's scraps that demand high prices now are ribs, Buffalo wings and hamburger meat. Today's leftovers are the dark-meat portions of a chicken, at least in the United States. The market opportunity for the dark-meat project "is probably not now," he said. "But it could be a hot product tomorrow. Food shortages will occur again. It's a political issue, not an agricultural issue. It's always nice to have potential ways to keep the food market healthy and nutritious." Fletcher points to the Great Depression of the 1930s as an example. He remembers some touchy food times during his lifetime, too. When President Jimmy Carter put a ban on chicken exports, he said, "it almost killed the poultry industry in Georgia. Likewise, Sept. 11, 2001, hurt the cattle industry, especially because there was such a decline in eating out." More than half of the meals Americans eat are prepared outside the home. "This project gives us a better way to utilize dark meat, instead of just sending it to other countries," he said.